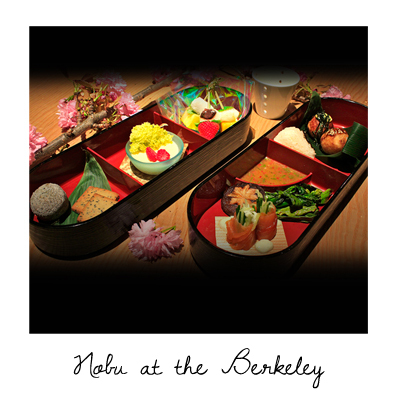 First off the blocks is a revised afternoon tea offering from my favourite London restaurant: Nobu Berkeley. I love everything about Nobu, from the ruby red tuna sashimi through to the unrivalled desserts, and when I saw their take on the great British afternoon tea I went weak at the knees! Served 3PM- 5.30PM Monday to Friday, the menu involves Takoyaki (delicious battered octopus balls), smoked salmon sashimi with cucumber and wasabi sour cream, green tea and Yuzu doughnut and fruit skewers. The quirky menu is available with infusion tea for £30, with the fabulous Nobu collection of teas for £32.50, with a glass of Billecart Salmon Brut for £40 and with both for £42.50. Perfect to round of Jubilee weekend in style, click here to reserve a table. 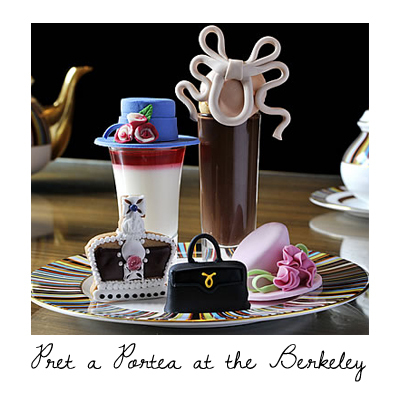 Hot on Nobu's heels from the Caramel Room at the Berkeley is the new take on the famous Pret-A-Portea. This season it is all about her majesty with some patriotic pastries. All served on iconic Paul Smith crockery, the Royal Collection has a number of cheery royal treats including a praline profiterole inspired by Beatrice's fascinator, a pannacotta macaroon inspired by the Duchess of Cambridge and a delightful studded vanilla biscuit resembling the crown. This little piece of patisserie heaven is available from 1-6PM until 9th of June, so get your skates on! It is £39 per person, £49 with a glass of Laurent Perrier and £55 with couture champagne- if you are really ready for a royal indulgence. Click here for details- spaces are limited and reservations are very much advised. Whether you love it or hate it, I don't doubt that you will be a little endeared by the limited edition jars of Ma'amite all over the shops at the moment. The salty spread has the UK divided, but is now the centrepiece of a delicious afternoon tea spread at one of Chelsea's finest hotels. 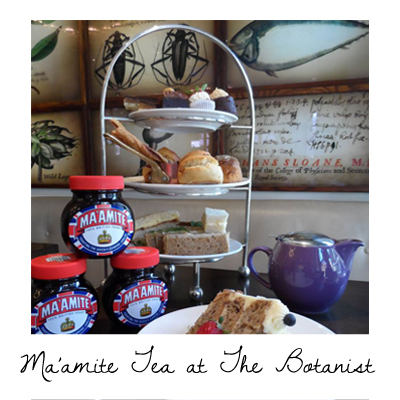 The Botanist are serving the Marmite Afternoon Tea until the 10th of June and it really is a treat. The ladies offering (£18 without Champagne, £25 with) involves assorted finger sandwiches, delicious cheddar and Marmite scones, Marmite cheese straws and some bizarre but intriguing desserts including chocolate cake with Marmite caramel buttercream (presumably a salted caramel effect? ), Black Velvet cupcakes and a Marmite and peanut butter brownie. Not for traditionalists, but certainly worth a try. Gents can opt for a manly version (£25 with a Marmite Mary) without all the fancy pastries and instead with a hearty marmite rarebit. Intrigued? Click here to make a reservation. One for the boys. For £50 you can enjoy a full-on gentleman's feast at the Sanctum hotel in Soho. It really is a feast! It kicks off with a poached oyster with bloody mary relish, steak and mushrooms on sourdough and smoked salmon and caviar on a bagel. The hearty mini mains include a lamb and potato hotpot, a mini beef burger, a rabbit and pancetta pasty and a roast beef stuffed Yorkshire. If that wasn't quite enough, the sweet comes courtesy of a dark and unctuous twice baked chocolate fudge cake with Jack Daniels ice cream. It is all washed down with tea and coffee, a tankard of Jack Daniels and a cigar to be smoked on the roof garden. Wow. Think you can handle all that? Click here. Alas, it is the last day of the Diamond Jubilee, so what better way to spend your day than with one of London's fabulous Afternoon Teas. There's nothing more British than tea and cake, and the staid afternoon tea- those tiers of mini sarnies and sickly petit fours- has had a culinary makeover, and it is officially chic. From royal themed biccies to Japanese fruit skewers, Afternoon Tea has never been cooler for us ladies. Also there is one for the boys! 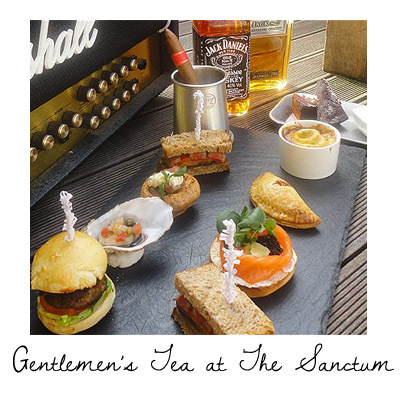 The latest foodie trend is afternoon tea for men, the best of which is available at The Sanctum in Soho. The Ma'amite afternoon tea is also available in a gentlemen friendly guise.